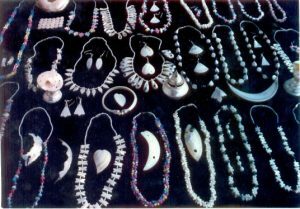 The Pearl Button Industry at Mehsi, only one of its kind in the whole of the country which had earned fame in the world. Mehsi is a small rural market adjacent to the Mehsi railway station about 48 km. east of Motihari in East Champaran district. 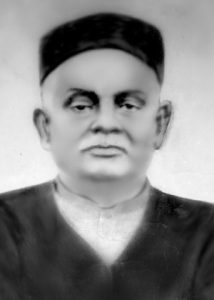 The industry owed its origin to an enterprising sub-inspector of schools, Bhulawan Lal, an inhabitant of Mehsi who began handcrafting the buttons from oysters found in the river Sikrahna in 1905. In spite of the fact that buttons so prepared then did not get good finished the idea of encouraging indigenous industries prompted them to the manufacture of such buttons. It is learnt that some samples of such buttons were sent to Mr. Motilal Ghosh, the then editor of Amrita Bazar Patrika who wrote that since the buttons had a bad finish, they could not have any marketable value. Such a remark from the veteran journalist impelled the originators to install machinery and a set of the same was imported from Japan. With this machine and a small capital outlay of Rs. 1000, the first button factory under the name of Tirhut Moon Button Factory was established here in 1908. Subsequently it was registered under the Indian Company Act. The factory flourished huge profits facilitated establishment of many more factories at Mehsi. Till the First World War the industry had to face competition from the Japanese buttons in India But during war years japans buttons became scarce and the buttons of Mehsi got a fillip. After the first war Japanese button again captured market in India and pushed back the Mehsi buttons. As per government records the Second World War put a check on the Japan make buttons and demand for Mehsi buttons shot up in the Indian market and some foreign countries also. At that time 160 button factories spreader over 13 panchayats of Mehsi Block ran smoothly. The output of buttons is reported to have been about 24 lakh gross per annum of different types. The quality was of three types – big, medium and small for all purchases except coating. There were 10,000 artisan and laborers employed in this cottage industry. It also employed additional workers in piecing the refuse pearls, which are used in decorating floors. Children and women were also employed for pasting button papers sheets. The artisans engaged in the factories mostly belong to two categories. First, those who collect Oyster Shells from rivers and second those who are engaged in manufacturing buttons. The raw material- Oyster shells-are collected by professional workers belonging to Mushar Batar and other community of scheduled caste, in Sikrahna, Bagmati and Mahananda in Champaran, Muzaffarpur and Darbhabga districts of North Bihar. Roughly about 15 thousand such labourers are engaged. These traditional labourers derive twin benefits. They collect live Oyster shells from the river which provide meat before being sold to the button industry owners. As the collection of oyster-shells from the riverbeds emerged as good business, the government of Bihar stepped in and formed a Samanya Seva Sangathan (S.S.S) under the control of industry department in year 1956. S.S.S. officials fixed its headquarters at Mehsi to help the proprietors tackle the problems. The main idea behind formation of Samanya Seva Sangathana was to procure materials and markets for the finished goods. For the first time middleman ship was started in this business by government itself. The employees of Samanya Seva Sangathan, after obtaining requisite permits from revenue department collected oyster-shells from the river belts of North Bihar and supplied to the same to the button manufacturing units of Mehsi on commission basis. 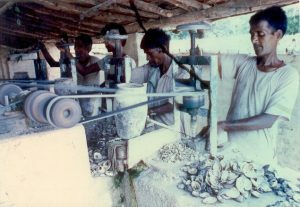 This unique cottage industry of button received a severs jolt in 1964 when the ownership of oyster shells of rivers was transferred to the mines department from revenue department under Mines and Mineral Act 1964. For one year lease a huge sum had to be paid to the mines department in shape of royalty, surface rent and advance. Formerly where a meager sum of Rs.10 was paid for collecting oyster-shells up to a mile in a riverbed, now nearly RS.1000 has to be paid after the enforcement of the mine act 1964 . This Act is remembered at Mehsi as a black Law. It May be recalled that while granting lease by the mines authority specific distance and place in the riverbed, as shown in the river map, is allowed for operation. As the oyster shells are live they crawl from one place to another. In such eventualities one may have to bite the dust. The faulty procedures adopted by the mines department in granting permit for collecting oyster-shells, inflated cost of raw materials, and one of mines department officials with the middlemen, all have told heavily on the prospect of the button industry. Even as this industry was still licking its wound inflicted by the middlemen-office nexus and acute shortage of requisite infrastructure, it received another blow. Nylon buttons over-flooding the markets. 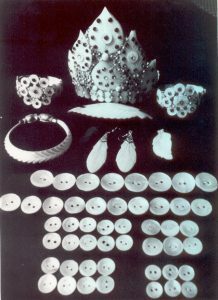 The pearl-button produced by the cottage industry could not complete in the world market as the nylon buttons fully satisfied the fads of fashion able youngsters. The moneylenders still have a full grip over the button industries. They advance money on exorbitant rates of interest and compel the industry owners to sell their finished goods to them only. With the result that they make good fortune in collusion with the groups of middlemen in Bombay. Calcutta and Madras. Three big money lenders have captured the total market of Mehsi buttons. The Samanya Seva Sangathan that came in to existence to streamline the industry purchased finished buttons and found suitable markets inside and outside of country. The pearl button industry at Mehsi which ranged 160 units in 13 panchayats of Mehsi Anchal, giving employment to about 10,000 skilled workers directly and 20,000 workers indirectly.